As if there's someone else, other than me, who doesn't. Victoria Beckham's flat tire in February 20th. Given the seemingly perfect tire life I had, when I lost my spare tire [which I forgot how], I wasn't frothing at the mouth to buy a replacement. Also, I wasn't driving everyday, like I did before, since the skyway construction-induced traffic is too much for me. Ho hum. Until this morning, when I went home to my brother at Quezon City to drive him to the airport when I realized that yes, I'm not invincible and I need a spare tire. We left Araneta Ave. at 3:20 AM. When I was coursing through Quirino, near the Columbian, I already started hearing hissing sounds. Of course, I ignored it. Shortly after I turned left to Osmena Highway, the hissing sounds turned to unbelievably loud popping sounds. My brother said, "Ate, your tires are flat." I turned on the hazard lights and looked for an establishment with lights on. I quickly eased the car into the PTT Gas Station and got off. Then I saw that my left rear tire was ripped. As I've mentioned, my brother was off to the US in a few hours, thus, I couldn't make him wait for me. I have some reservations when it comes to flagging a cab along Pasay streets, and on 4 AM nonetheless. It was a good thing that a kind, elderly cab driver came along and I felt that my brother was safe so I eventually allowed him to, after calling cabs over the phone. After he left, I pretty much had to deal with my ripped tire. Thankfully, a policeman in civilian was in the area and offered to help me bring my car to Evangelista St. [a popular street in Manila where they can fix everything and tires are cheap] so I could buy new ones. I debated about this for about a minute and decided to go ahead and accept the offer. I didn't know how to go about it, too and I couldn't drive my car going there with all the popping sounds, anyway. I of course, realize, that it was a very dangerous move, as not all policemen in the country are acting the way they should be. And when something like a busted tire happens to you, don't panic. Find a gas station, or a police station and park your car. If you live in Manila, it may not be safe to just park anywhere. If you can, stay inside your car first before going out of the car. 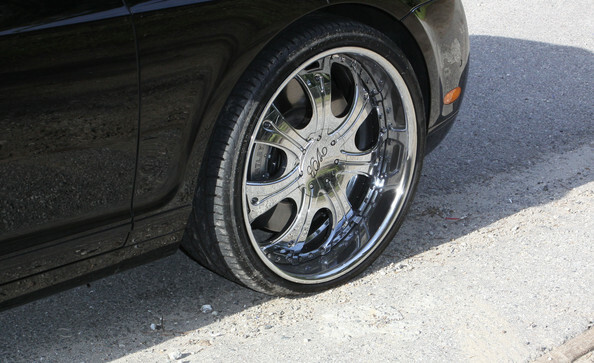 In the past years, there were thieves who took advantage of drivers who get flat tires, those who get on the car shortly after the driver descends. When you get a flat tire, you don't automatically need to stop, just turn on your hazard lights and slow down. Panicking will alter your sense of direction and focus, it might alarm other drivers and may cause a collision. Don't be an inconvenience to others, unlike the guy who had to get his phone and bump into Jheng's car. Tsk. Prevention is better than cure. Before you start the engine, check all the tires. Do they look marshmallowy? Do they have bumps? If yes, replace them asap. Do they have the right pressure? The usual pressure for a sedan is 30 PSI. If you have passengers, have them alight the car first, before adding pressure. Don't forget to check your spare tire's pressure, too. Checks should not be limited to tires alone. Check other factors such as water, leaks, gas gauge etc. I once had a gauge problem. My gauge was not showing that I had no more gasoline. As it is, my car died along Aurora Boulevard and I was stuck in traffic. I didn't dare get off because I was scared of people who might approach me so I waited for the family driver. When he finally came, and with gallons of gasoline, my car's battery went dead so we reallly had to make a big commotion to the other vehicles. It was then that a young guy [and very, very cute] approached me and asked me if I was okay. Apparently, he was worried that I was being helped by someone I didn't know. He eventually called a mechanic to fix my car on the spot. He reappeared on my doorstep the next day with flowers and made ligaw with the parents. He was a really nice guy but it was three years ago and I've eventually lost communication with him. What a way to meet a guy, right? Now going back --- don't forget about tools that can help you with car troubles. Have on hand stuff like: tire jack, wrench, and other thingamajig that comes with a tire-changing kit. I have this spray-on inflator, too but it's only useful when the tires are not ripped. Have a liter of water inside the trunk in case your car overheats at any time. Have enough money in your wallet, and an emergency fund, too! Having a car is no joke. The expenses under normal circumstances are heavy as it is. Imagine having to replace tires before they're due can be a pain in the ***. A good 165/85/R14 tire costs as much as two MAC foundations, and that is no joke. What I'm saying is, just be ready coz having a car is like having a high-maintenance wife.